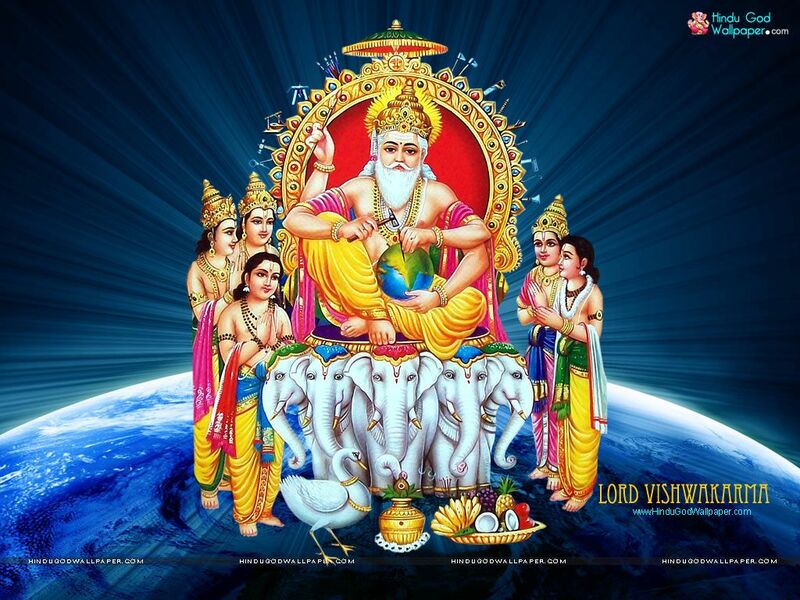 Shri Vishwakarma, Divine Architect is called ‘Devashilpi’ or ‘The Architect of Gods’. He has created many wonders, his wonders are described in Rigveda. The Rig Veda describes Viswakarma as the god with multi-dimensional vision and supreme strength. Vishwa karma is able to predict well in advance in which direction his creation will move. He is the designer of all the palaces and flying chariots of the gods. He is said to have revealed the Sthapatyaveda or fourth Upa-veda, and presides over the sixty-four mechanical arts. He is also credited for creating the weapons used by gods, including Sudarshana Chakra the sacred weapon of Lord Vishnu and Krishna. He is regarded as the supreme worker, the very essence of excellence. Vishwakarma built the golden city of Lanka where the King Ravana ruled. He also designed Hastinapur, the capital of Kauravas and Pandavas. On an invitation of Lord Krishna, He also built the city “Indraprastha” earlier known as “Khandavprastha”. Which was offered by Dhritarashtra when asked by Yudhisthir. He also built the Holy city of Dwarka – The capital of Lord Krishna after he left Mathura. He is a Presiding deity of all mechanics, craftsmen, artisan, and handicrafts worker. Vishwakarma is worship by all factory owners and architects when the sun enters the Bhadrapada phase this Day is known as “Vishwakarma Day”. Vishwakarma Puja falls on the last day of the month Bhadra which is also known as Bhadra Sankranti or Kanya Sankranti. Vishwakarma Puja usually takes place within the factory premises or shop floor and engineering and mechanical workshops. This occasion in a way also marks the start of the festive season that culminates in Diwali. The sunrise timing on the day is at 6:17 AM and the sunset time is at 6:24 PM. According to Drik Panchang, the Sankranti moment is at 00:54 on September 17th.